This article is about the physics of the hydrogen atom. For a chemical description, see hydrogen. For monatomic hydrogen, see Hydrogen § Atomic hydrogen. In everyday life on Earth, isolated hydrogen atoms (called "atomic hydrogen") are extremely rare. Instead, a hydrogen atom tends to combine with other atoms in compounds, or with another hydrogen atom to form ordinary (diatomic) hydrogen gas, H2. "Atomic hydrogen" and "hydrogen atom" in ordinary English use have overlapping, yet distinct, meanings. For example, a water molecule contains two hydrogen atoms, but does not contain atomic hydrogen (which would refer to isolated hydrogen atoms). Atomic spectroscopy shows that there is a discrete infinite set of states in which a hydrogen (or any) atom can exist, contrary to the predictions of classical physics. Attempts to develop a theoretical understanding of the states of the hydrogen atom have been important to the history of quantum mechanics, since all other atoms can be roughly understood by knowing in detail about this simplest atomic structure. The most abundant isotope, hydrogen-1, protium, or light hydrogen, contains no neutrons and is simply a proton and an electron. Protium is stable and makes up 99.985% of naturally occurring hydrogen atoms. Deuterium contains one neutron and one proton. Deuterium is stable and makes up 0.0156% of naturally occurring hydrogen and is used in industrial processes like nuclear reactors and Nuclear Magnetic Resonance. Tritium contains two neutrons and one proton and is not stable, decaying with a half-life of 12.32 years. Because of the short half life, tritium does not exist in nature except in trace amounts. Higher isotopes of hydrogen are only created in artificial accelerators and reactors and have half lives around the order of 10−22 (0.0000000000000000000001) second. The formulas below are valid for all three isotopes of hydrogen, but slightly different values of the Rydberg constant (correction formula given below) must be used for each hydrogen isotope. Hydrogen is not found without its electron in ordinary chemistry (room temperatures and pressures), as ionized hydrogen is highly chemically reactive. When ionized hydrogen is written as "H+" as in the solvation of classical acids such as hydrochloric acid, the hydronium ion, H3O+, is meant, not a literal ionized single hydrogen atom. In that case, the acid transfers the proton to H2O to form H3O+. Ionized hydrogen without its electron, or free protons, are common in the interstellar medium, and solar wind. is the classical electron radius. If this were true, all atoms would instantly collapse, however atoms seem to be stable. Furthermore, the spiral inward would release a smear of electromagnetic frequencies as the orbit got smaller. Instead, atoms were observed to only emit discrete frequencies of radiation. The resolution would lie in the development of quantum mechanics. Electrons can only be in certain, discrete circular orbits or stationary states, thereby having a discrete set of possible radii and energies. Electrons do not emit radiation while in one of these stationary states. An electron can gain or lose energy by jumping from one discrete orbital to another. is the quantum number (now known as the principal quantum number). Bohr's predictions matched experiments measuring the hydrogen spectral series to the first order, giving more confidence to a theory that used quantized values. is about 1/1836 (i.e. the electron-to-proton mass ratio). For deuterium and tritium, the ratios are about 1/3670 and 1/5497 respectively. 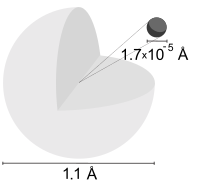 These figures, when added to 1 in the denominator, represent very small corrections in the value of R, and thus only small corrections to all energy levels in corresponding hydrogen isotopes. Most of these shortcomings were resolved by Arnold Sommerfeld's modification of the Bohr model. Sommerfeld introduced two additional degrees of freedom, allowing an electron to move on an elliptical orbit characterized by its eccentricity and declination with respect to a chosen axis. This introduced two additional quantum numbers, which correspond to the orbital angular momentum and its projection on the chosen axis. Thus the correct multiplicity of states (except for the factor 2 accounting for the yet unknown electron spin) was found. Further, by applying special relativity to the elliptic orbits, Sommerfeld succeeded in deriving the correct expression for the fine structure of hydrogen spectra (which happens to be exactly the same as in the most elaborate Dirac theory). However, some observed phenomena, such as the anomalous Zeeman effect, remained unexplained. These issues were resolved with the full development of quantum mechanics and the Dirac equation. It is often alleged that the Schrödinger equation is superior to the Bohr-Sommerfeld theory in describing hydrogen atom. This is not the case, as most of the results of both approaches coincide or are very close (a remarkable exception is the problem of hydrogen atom in crossed electric and magnetic fields, which cannot be self-consistently solved in the framework of the Bohr-Sommerfeld theory), and in both theories the main shortcomings result from the absence of the electron spin. It was the complete failure of the Bohr-Sommerfeld theory to explain many-electron systems (such as helium atom or hydrogen molecule) which demonstrated its inadequacy in describing quantum phenomena. The Schrödinger equation allows one to calculate the development of quantum systems with time and can give exact, analytical answers for the non-relativistic hydrogen atom.
. Electrons in this state are 45% likely to be found within the solid body shown. is the Kronecker delta function. The solutions to the Schrödinger equation for hydrogen are analytical, giving a simple expression for the hydrogen energy levels and thus the frequencies of the hydrogen spectral lines and fully reproduced the Bohr model and went beyond it. It also yields two other quantum numbers and the shape of the electron's wave function ("orbital") for the various possible quantum-mechanical states, thus explaining the anisotropic character of atomic bonds. The Schrödinger equation also applies to more complicated atoms and molecules. When there is more than one electron or nucleus the solution is not analytical and either computer calculations are necessary or simplifying assumptions must be made. Since the Schrödinger equation is only valid for non-relativistic quantum mechanics, the solutions it yields for the hydrogen atom are not entirely correct. The Dirac equation of relativistic quantum theory improves these solutions (see below). The solution of the Schrödinger equation (wave equation) for the hydrogen atom uses the fact that the Coulomb potential produced by the nucleus is isotropic (it is radially symmetric in space and only depends on the distance to the nucleus). Although the resulting energy eigenfunctions (the orbitals) are not necessarily isotropic themselves, their dependence on the angular coordinates follows completely generally from this isotropy of the underlying potential: the eigenstates of the Hamiltonian (that is, the energy eigenstates) can be chosen as simultaneous eigenstates of the angular momentum operator. This corresponds to the fact that angular momentum is conserved in the orbital motion of the electron around the nucleus. Therefore, the energy eigenstates may be classified by two angular momentum quantum numbers, ℓ and m (both are integers). The angular momentum quantum number ℓ = 0, 1, 2, ... determines the magnitude of the angular momentum. The magnetic quantum number m = −ℓ, ..., +ℓ determines the projection of the angular momentum on the (arbitrarily chosen) z-axis. In addition to mathematical expressions for total angular momentum and angular momentum projection of wavefunctions, an expression for the radial dependence of the wave functions must be found. It is only here that the details of the 1/r Coulomb potential enter (leading to Laguerre polynomials in r). This leads to a third quantum number, the principal quantum number n = 1, 2, 3, .... The principal quantum number in hydrogen is related to the atom's total energy. Note that the maximum value of the angular momentum quantum number is limited by the principal quantum number: it can run only up to n − 1, i.e. ℓ = 0, 1, ..., n − 1. Due to angular momentum conservation, states of the same ℓ but different m have the same energy (this holds for all problems with rotational symmetry). In addition, for the hydrogen atom, states of the same n but different ℓ are also degenerate (i.e. they have the same energy). However, this is a specific property of hydrogen and is no longer true for more complicated atoms which have an (effective) potential differing from the form 1/r (due to the presence of the inner electrons shielding the nucleus potential). Taking into account the spin of the electron adds a last quantum number, the projection of the electron's spin angular momentum along the z-axis, which can take on two values. Therefore, any eigenstate of the electron in the hydrogen atom is described fully by four quantum numbers. According to the usual rules of quantum mechanics, the actual state of the electron may be any superposition of these states. This explains also why the choice of z-axis for the directional quantization of the angular momentum vector is immaterial: an orbital of given ℓ and m′ obtained for another preferred axis z′ can always be represented as a suitable superposition of the various states of different m (but same l) that have been obtained for z. In 1928, Paul Dirac found an equation that was fully compatible with Special Relativity, and (as a consequence) made the wave function a 4-component "Dirac spinor" including "up" and "down" spin components, with both positive and "negative" energy (or matter and antimatter). The solution to this equation gave the following results, more accurate than the Schrödinger solution. where α is the fine-structure constant and j is the "total angular momentum" quantum number, which is equal to |ℓ ± 1/2| depending on the direction of the electron spin. This formula represents a small correction to the energy obtained by Bohr and Schrödinger as given above. The factor in square brackets in the last expression is nearly one; the extra term arises from relativistic effects (for details, see #Features going beyond the Schrödinger solution). It is worth noting that this expression was first obtained by A. Sommerfeld in 1916 based on the relativistic version of the old Bohr theory. Sommerfeld has however used different notation for the quantum numbers. 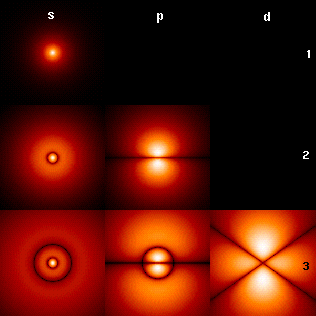 The image to the right shows the first few hydrogen atom orbitals (energy eigenfunctions). These are cross-sections of the probability density that are color-coded (black represents zero density and white represents the highest density). The angular momentum (orbital) quantum number ℓ is denoted in each column, using the usual spectroscopic letter code (s means ℓ = 0, p means ℓ = 1, d means ℓ = 2). The main (principal) quantum number n (= 1, 2, 3, ...) is marked to the right of each row. For all pictures the magnetic quantum number m has been set to 0, and the cross-sectional plane is the xz-plane (z is the vertical axis). The probability density in three-dimensional space is obtained by rotating the one shown here around the z-axis. The "ground state", i.e. the state of lowest energy, in which the electron is usually found, is the first one, the 1s state (principal quantum level n = 1, ℓ = 0). (the remaining non-angular nodes) are radial nodes. Although the mean speed of the electron in hydrogen is only 1/137th of the speed of light, many modern experiments are sufficiently precise that a complete theoretical explanation requires a fully relativistic treatment of the problem. A relativistic treatment results in a momentum increase of about 1 part in 37,000 for the electron. Since the electron's wavelength is determined by its momentum, orbitals containing higher speed electrons show contraction due to smaller wavelengths. Both of these features (and more) are incorporated in the relativistic Dirac equation, with predictions that come still closer to experiment. Again the Dirac equation may be solved analytically in the special case of a two-body system, such as the hydrogen atom. The resulting solution quantum states now must be classified by the total angular momentum number j (arising through the coupling between electron spin and orbital angular momentum). States of the same j and the same n are still degenerate. Thus, direct analytical solution of Dirac equation predicts 2S(1/2) and 2P(1/2) levels of Hydrogen to have exactly the same energy, which is in a contradiction with observations (Lamb-Retherford experiment). In the language of Heisenberg's matrix mechanics, the hydrogen atom was first solved by Wolfgang Pauli using a rotational symmetry in four dimensions [O(4)-symmetry] generated by the angular momentum and the Laplace–Runge–Lenz vector. By extending the symmetry group O(4) to the dynamical group O(4,2), the entire spectrum and all transitions were embedded in a single irreducible group representation. In 1979 the (non relativistic) hydrogen atom was solved for the first time within Feynman's path integral formulation of quantum mechanics. This work greatly extended the range of applicability of Feynman's method. ^ Palmer, D. (13 September 1997). "Hydrogen in the Universe". NASA. Archived from the original on 29 October 2014. Retrieved 23 February 2017. ^ a b Housecroft, Catherine E.; Sharpe, Alan G. (2005). Inorganic Chemistry (2nd ed.). Pearson Prentice-Hall. p. 237. ISBN 0130-39913-2. ^ Olsen, James; McDonald, Kirk (7 March 2005). "Classical Lifetime of a Bohr Atom" (PDF). Joseph Henry Laboratories, Princeton University. ^ "Derivation of Bohr's Equations for the One-electron Atom" (PDF). University of Massachusetts Boston. ^ Messiah, Albert (1999). Quantum Mechanics. New York: Dover. p. 1136. ISBN 0-486-40924-4. ^ Condon and Shortley (1963). The Theory of Atomic Spectra. London: Cambridge. p. 441. ^ Bransden, B. H.; Joachain, C. J. (1983). Physics of Atoms and Molecules. Longman. p. Appendix 5. ISBN 0-582-44401-2. ^ Pauli, W (1926). "Über das Wasserstoffspektrum vom Standpunkt der neuen Quantenmechanik". Zeitschrift für Physik. 36 (5): 336–363. Bibcode:1926ZPhy...36..336P. doi:10.1007/BF01450175. ^ Kleinert H. (1968). "Group Dynamics of the Hydrogen Atom" (PDF). Lectures in Theoretical Physics, edited by W.E. Brittin and A.O. Barut, Gordon and Breach, N.Y. 1968: 427–482. ^ Duru I.H., Kleinert H. (1979). "Solution of the path integral for the H-atom" (PDF). Physics Letters B. 84 (2): 185–188. Bibcode:1979PhLB...84..185D. doi:10.1016/0370-2693(79)90280-6. ^ Duru I.H., Kleinert H. (1982). "Quantum Mechanics of H-Atom from Path Integrals" (PDF). Fortschr. Phys. 30 (2): 401–435. Bibcode:1982ForPh..30..401D. doi:10.1002/prop.19820300802. Griffiths, David J. (1995). Introduction to Quantum Mechanics. Prentice Hall. ISBN 0-13-111892-7. Section 4.2 deals with the hydrogen atom specifically, but all of Chapter 4 is relevant.